For the beginning part of memorial day weekend, I spent some time at my lake house on Lake Anna in Virginia. On Friday, I was jet skiing and came across a wedding taking place outside right on the edge of the water of a very large house. There was a big white tent set up outside and all the guests were congregrated under the tent or near the dock. The couple was just departing in a boat!!! And I got to watch the very unique send off. I stopped my jet ski and my friend and I sat there and watched. It was incredible. The boat started pulling away with the bride and the groom, and the bride upon seeing us began waving. We waved back, but I felt like I was intruding so I was on my way again. Thinking back, I realize how incredibly unique and special water weddings are. There are so many ways to do a wedding on the water. Whether it be like this couple or doing the entire wedding on a yacht (this has always been a dream of mine, at least for the reception). Or even a beach wedding. It's especialy fun when the couple departs in a boat or utilizes the water in some special way. 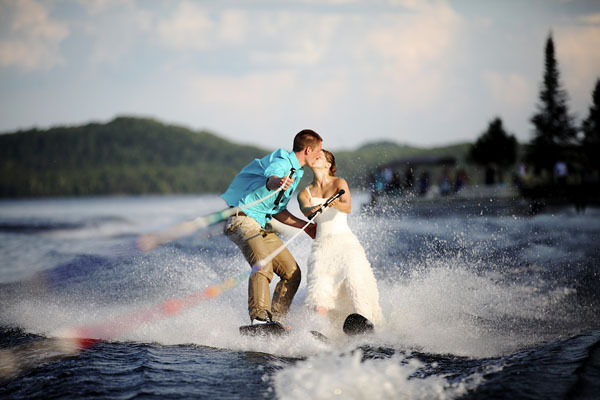 I came across this amazing photo and post about a Canadian lake wedding-seriously how cool is this shot! Check out the full wedding here!